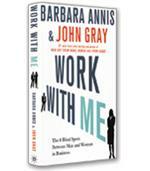 In this groundbreaking comprehensive analysis, based on more than twenty-five years of in-depth surveys involving 100,000 men and women across dozens of Fortune 500 companies, Barbara Annis and Keith Merron provide a deeper understanding of the multiplicity of forces that have combined to create and perpetuate gender inequality. Gender Intelligence exposes common false assumptions that prevent men and women from successfully performing together at work. The glass ceiling is still very much intact, write di­versity consultants Barbara Annis and Keith Merron in their book Gender Intelligence, not because companies are unwilling to change but because companies are approaching the problem with the wrong mindset. The most well-meaning diversity managers and their executive bosses are failing in their efforts to empower women and develop more women leaders, because they are trying to build equality in numbers and same­ness in behavior. In other words, in the male-domi­nated workplace, Annis and Merron write, women are taught that success depends on women acting more like men. What men do makes no difference, and they don’t have to change anything; it’s women who have to change. Other leaders insist that they don’t discriminate against women. In their companies, these leaders explain, they have “gender-blind meritocracies.” The problem is that in many organizations, the supposedly objective criteria used to judge performance is based on male tendencies. For example, high-tech firms value people who communicate in a very rapid style, who are incredibly analytical, and who will tear down any idea or anyone that demonstrates a flaw in their thinking; these are typically male traits, and not surprisingly, women avoid the resulting aggressive, conflict-ridden environment created by such traits. The fact is that men and women are different and will always be different, the authors emphasize. In an early chapter of the book, the authors lay out the neurosci­ence that reveals how the brains of men and women are structured differently — for example, women have a greater prefrontal cortex, which enhances conse­quential thinking and moderates social behavior, thus leading them to look for win-win solutions to conflict, while men are going to take a more competitive ap­proach. In the second half of the book, the authors focus on achieving this productive blend. 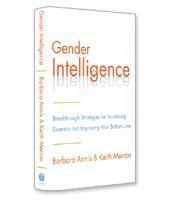 They lay out, for example, the three fundamental shifts for becoming a gender-intelligent leader: 1) going from a sameness mindset to embracing the value in gender differences; 2) creating meritocracies based on different models for success; and 3) recognizing when their behaviors are not congruent with their intentions — too many leaders have gender blind spots that undermine their well-meaning efforts. The authors also explore how functions, processes and systems work in gender-intelligent organizations. For example, Deloitte, which once depended on nearly all-male consultants advising all-male clients, now recognizes that women partners who listen, are understanding and encourage dialogue can be effective and in some instances even more effective consultants than their male colleagues. The greatest contribution of this essential book, however, is in shining a light on the fact that the glass ceiling exists not because men want it there but because both men and women working to shatter the ceiling are building their efforts on the wrong assump­tions.